OnePlus 3 comes with fingerprint scanner embedded in the home button. 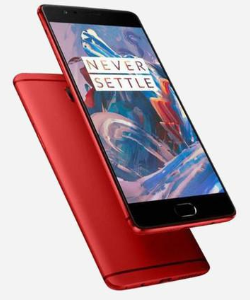 The OnePlus 3 flaunts a 5.5-inch full HD (1080p) display and is powered by Qualcomm Snapdragon 820 quad-core processor paired with 6GB of RAM and 64GB of onboard storage, and Read More.. Description OnePlus 3 comes with fingerprint scanner embedded in the home button. The OnePlus 3 flaunts a 5.5-inch full HD (1080p) display and is powered by Qualcomm Snapdragon 820 quad-core processor paired with 6GB of RAM and 64GB of onboard storage, and 16-megapixel rear camera of aperture f/2.0 with PDAF and OIS, and an 8-megapixel camera up front. Other connectivity options like dual Nano SIM card slots, 4G LTE support, Wi-Fi, GPS, and Bluetooth. On the software runs on Android Marshmallow 6.1 OxygenOS. The OnePlus 3 will be available in Graphite and Soft Gold color options. OnePlus 3 comes with fingerprint scanner embedded in the home button. The OnePlus 3 flaunts a 5.5-inch full HD (1080p) display and is powered by Qualcomm Snapdragon 820 quad-core processor paired with 6GB of RAM and 64GB of onboard storage, and 16-megapixel rear camera of aperture f/2.0 with PDAF and OIS, and an 8-megapixel camera up front. Other connectivity options like dual Nano SIM card slots, 4G LTE support, Wi-Fi, GPS, and Bluetooth. On the software runs on Android Marshmallow 6.1 OxygenOS. The OnePlus 3 will be available in Graphite and Soft Gold color options. No reviews available for #OnePlus3, Do you know OnePlus 3?, Please add your review and spread the good things.